So quickly, our time in Green Valley is coming to a close. Seems like we spent so much of our time here waiting for decent weather. Now that it’s here, we need to spend a bunch of our time preparing for our departure (an especially big job since we are leaving Fema for good), and also trying to figure out what we’re going to do next winter when we want to come back for a month or so. But, what the hell? We can’t spend all of our time working when there’s a hike to be had. Especially such a great hike that our friend and hike leader Sam had planned for Monday. 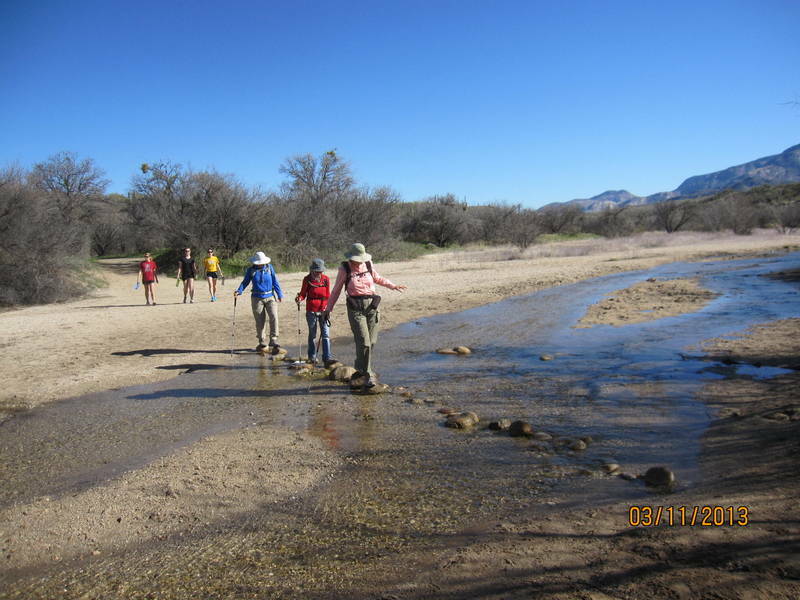 We headed to Catalina State Park, on the north edge of Tucson, for a hike on the Romero Pools Trail. Such a great decision…. Even in all the years he’s come to this area, John had never hiked in Catalina SP, so we didn’t really know what to expect for this hike. It was billed as about 7 miles round trip, with the ‘pools’ being at the turnaround point of the hike. So, eight of us took off, climbing (what else?) up the trail, after first crossing a small stream. Hoping that my boots were indeed waterproof as I remembered, I brashly waded thru the water instead using the stepping stones. Luckily, my boots prevailed. This trail was more fun than many we have hiked – the base was rock and boulder surfaces, rather than paths of gravel or stones. Makes a bit of a scramble with each step, and tests out your boots. 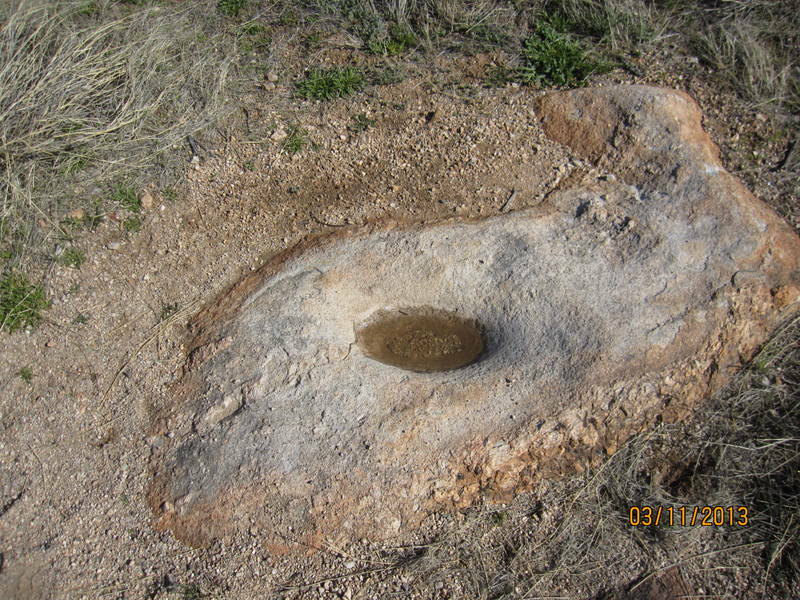 A mortar rock – used by the Indians to grind grains. The hold would be filled with grain, and ground with another rock. This one was filled with water from recent rains & snow runoff. We moved steadily upward and wound our way around ocotillo and saguaro cactus, and many blooming wildflowers. It was a bright blue sunny day – not too warm, and windless. Nearly ideal. Seemed like no time at all before we got to the pools. Like Grand Central Station – there were mobs of folks there, and more on the trail behind us. Sam suggested that we continue on for another mile to a second set of pools where there (hopefully) would be a quiet place for lunch. Bingo! No bighorns in sight today. We just camped out like turtles at our lunch spot. Wonderful! Back at the base, we said bye for the season to our hiking friends. We’ll be on the road again before next week’s hike. It’s been a great season….on to Nimbus for one last cold beer before heading home. 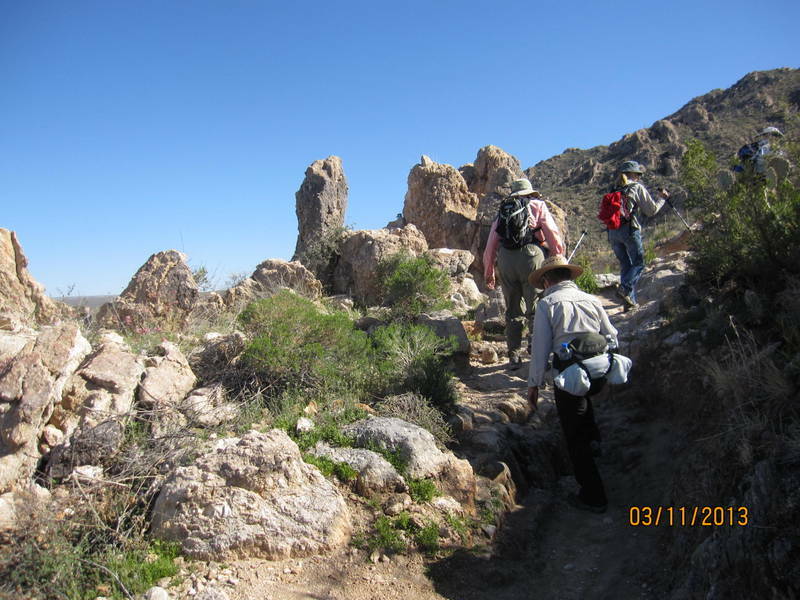 This entry was posted in Arizona, hiking and tagged Arizona, beer, hiking by Judy Crankshaw. Bookmark the permalink.